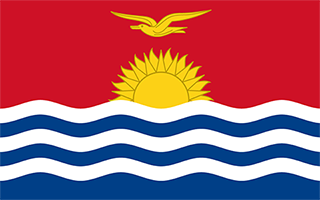 Kiribati with its capital Tarawa is located in Oceania (Oceania, group of 33 coral atolls in the Pacific Ocean). It covers some 812 square kilometers (four times the size of Washington, DC) with a population of 108,145. English is the language spoken by people in Kiribati. There are no land based border this country shares with any other country. Kiribati is an island group in Micronesia straddling the equator and, until 1995, the International Date Line. Kiribati is most emphatically not another Tahiti, Hawaii, etc. where you can go to relax and have nothing to worry about. It has few visitors, and they have to be prepared to rough it. That said, there aren't many countries where the people are more friendly. South Tarawa is one of the most densely populated, severely poverty-stricken places in the world. Other islands have far fewer people, but getting to them can be difficult, and conditions are even more primitive. Most tourists, especially from the USA, go to Kiritimati (Christmas Island). It received some attention on January 1, 2000 as the first location in the world to experience the new millennium. The terrain is mostly low-lying coral atolls surrounded by extensive reefs. The average density of population is about 133 per km². The climate in Kiribati can be described as tropical with marine, hot and humid, moderated by trade winds. Possible natural disasters include low level of some of the islands make them sensitive to changes in sea level, occasional tornadoes and typhoons can occur any time, but usually November to March. To reach someone Kiribati dial +686 prior to a number. The local cellular networks are operated on 900 MHz, 3G, 4G. Websites typically end with the top level domain ".ki". If you want to bring electric appliances (e.g. battery chaarger), keep in min the local 240 V - 50 Hz (plugs: I). The sign for the locally used currency Dollar is AUD. The upper half is red with a yellow frigatebird flying over a yellow rising sun, and the lower half is blue with three horizontal wavy white stripes to represent the Pacific ocean; the white stripes represent the three island groups - the Gilbert, Line, and Phoenix Islands; the 17 rays of the sun represent the 16 Gilbert Islands and Banaba (formerly Ocean Island); the frigatebird symbolizes authority and freedom.